DESCRIPTION:- All the thrills on two wheels are back with Moto Racer 3 Gold Edition. The Gold edition presents a wide variety of brand new game modes, circuits, bikes and bonuses for extra challenges, thrills and life expectancy. 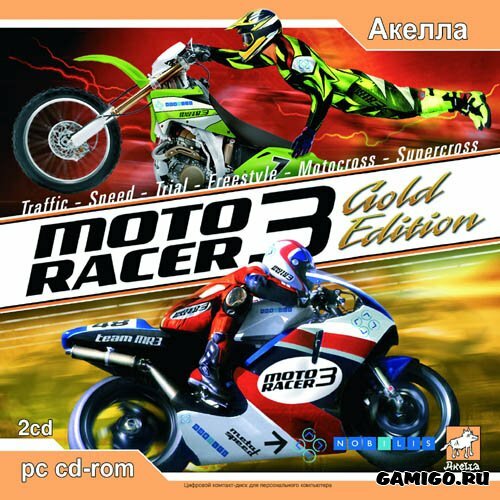 Moto Racer 3 Gold Edition gives both seasoned players and beginners alike all the high-octane thrills of the track, for up to 8 players. Building on the success of earlier PC games as well as the PlayStation's contemporary Moto Racer: World Tour, Delphine Software International's Moto Racer 3 offers six racing styles and 15 diversified venues featuring Grand Prix, touring, indoor and outdoor tracks. Familiar modes of street, supercross, motocross, freestyle, and trial racing are joined by the new traffic mode, which lets you run the streets of downtown Paris, France. Race 32 new bikes on courses based on actual tracks in France, Germany, Japan and Australia with special controls for trial bikes, traffic mode, SX/MX, and freestyle racing. Race types include practice, time attack, competition, and "friendly" runs with adjustable settings (speed, AI, time outs, and so forth). Three difficulty levels (easy, medium, and hard) are geared to each of the racing styles and allow for customization by both novices and veteran moto-racers. As in earlier versions, Moto Racer 3 provides fully adjustable settings in the areas of gear ratios, tires, suspension, engine electronics, and tilt (for jumps). Bikes include the GP 500cc and GP 250cc classes, as well as the Cross 250cc and 125cc, with the latter pair emphasizing acceleration more than speed. Multiplayer action is available for up to eight players over the Internet or a LAN.